More run time, more power and more recharges than all previous M18 batteries. HIGHER PERFORMANCE: Up to 2.5 times more run-time. Up to 20% more power. Up to 2 times more life (total lifetime output). UPGRADED THERMAL PERFORMANCE: Runs 20% cooler, providing longer battery life (recharges). Also delivers additional run-time in high draw applications. UPGRADED WATER PROTECTION: Routes water away from critical components, extending the life of the pack. Coating fully protects electronics. UPGRADED PACK PROTECTION: Shock responsive separators absorb vibration during high impact applications (Sawzall, HTIW, etc.) and drops. Single piece cell carrier fully secures cells, providing added protection. 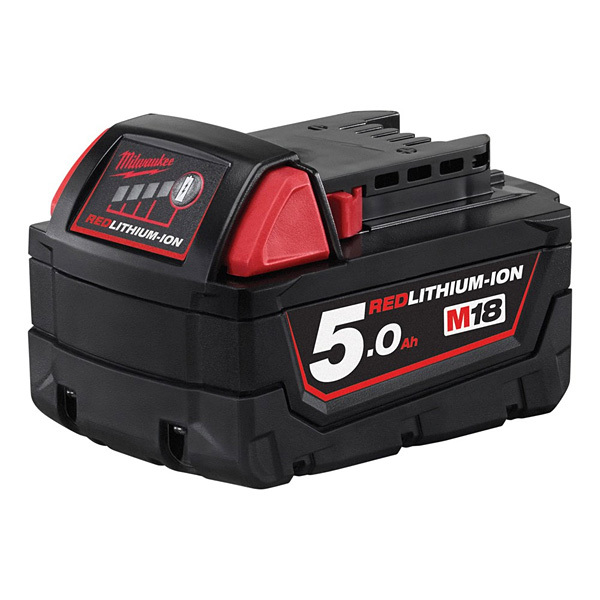 FULL SYSTEM INTEGRATION: All M18™ REDLITHIUM™ Batteries are compatible with all M18 cordless tools in the Milwaukee range.